There were plenty of laughs from the children in the audience including my four-year-old niece as the enchanting adaptation of Oscar Wilde’s short story, The Selfish Giant, comes to life. Grinter the giant (played by Tomasin Cuthbert) is just that: a giant. Or at least she is when you see that the children she is trying to keep out of her icy fortress are played by tiny puppets. All Grinter wants to do is live happily on her own in her huge cold house surrounded by snowy gardens set inside high frost-covered walls. Child-free. But then she finds traces of little beings who have been trespassing and she makes the walls even larger. But poor little Poppy (Tessa Bide) accidentally gets stuck inside the grounds after her chums manage to escape. 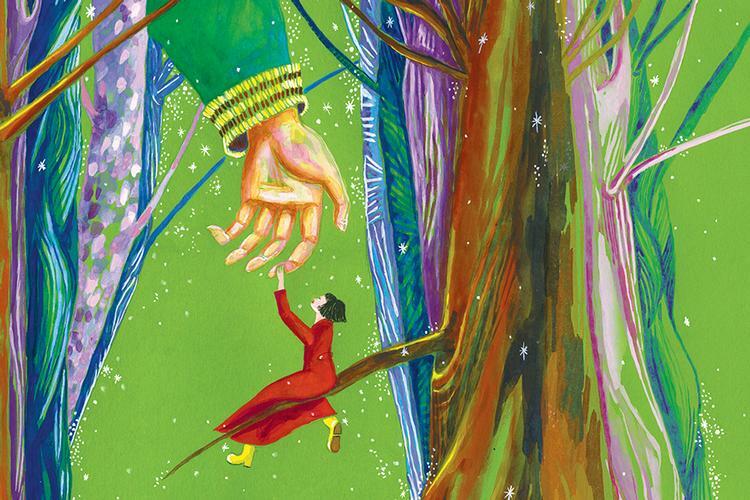 An unusual, heart-warming friendship blossoms and we learn how kindness can melt even the grumpiest giant’s heart and lives are changed forever. There were some endearing moments in this play at the Omnibus Theatre in Clapham and some fantastic music throughout. “Funny, sweet and cute” where the words my niece used to describe it. The set was great and the puppets were a brilliant tool to tell the tale and it clearly succeeded in captivating the kids. With a running time of just an hour, it was perfect timing to keep them all hooked in for the duration. And the icing on the cake was the VIP moment where the children were able to meet the puppets, ask questions and even give them a high five. The post-show interaction definitely went down a treat. The Selfish Giant is running until Christmas Eve.